People who study revolutions share many traits with people who study the weather. Both groups worry about cataclysms: when they might hit, how long and intense the duration of the storm, and how best to plan for the aftermath. The one difference, of course, is that no one can effectively steer the weather, while often human beings can (or at least try to) deflect revolutions on a different or reverse course. In its infancy, the study of cataclysms, whether they’re revolutions or hurricanes, focuses on causes. What forces combine to create the cataclysm? If you know what causes a revolution, you’re well on your way to predicting when it might happen—just as meteorologists issue storm warnings, sometimes under clear skies, when atmospheric bumps and troughs begin to collide. Revolutionary furor. Outrage, in this perspective, fuels revolution. Resentment against the pampered French aristocracy, the grievances of the American colonies against the British government, the disgust with communism across Eastern Europe—pick any revolution, and it’s easy to look at it through this lens. Some of the most articulate proponents of the “revolutionary furor” thesis include political scientists like Ted Robert Gurr, Theda Skocpol, and James Davies, historians of particular revolutions like Alexis de Tocqueville and Stephen Cohen, and, of course, Marx and Engels with their theory of class conflict and revolutionary consciousness. However, the “revolutionary furor” perspective crosses ideological lines, so someone arguing about middle class resentment against Salvador Allende’s policies before the military coup that ousted him is as likely to stress popular discontent as a neo-Marxist interpretation of the Iranian revolution. Social historians often appear in this camp, since their focus on everyday life is going to put popular discontent in the foreground of their research. Revolutionary opportunity. Revolution, in this perspective, is the apocalyptic resolution of an ongoing conflict among competing elites. Factions eager to seize power from their enemies ride the wave of popular discontent, but it’s merely one of many tools in the revolutionary leader’s arsenal. “The organizational weapon,” terror, intrigues, agitprop—there may be a mass audience, but it’s a small group of revolutionaries, the “counter-elite,” that creates these implements and directs their use. Again, you can find a mix of political scientists (for example, Charles Tilly) and historians (such as Richard Pipes and Edmund Burke) of many ideological stripes who argue this position. Often, people who write “grand histories” of important leaders and events will fall into this camp, again because of where they focus their attention. The two perspectives disagree on many points. For example, once people start making loud challenges to the status quo—angry Iranian students, marches of the sans culottes through Paris, demonstrators against Ceausescu—is it a good idea for the regime to try to buy them off by meeting some of their demands? The revolutionary furor theorist might say yes; the revolutionary opportunity theorist would say no. Reforms may dampen outrage, but they also embolden the counter-elites by demonstrating the regime’s lack of confidence in itself. People who cleave to one view or another might even define revolutions differently. If you think that the Russian Revolution was really the collapse of tsarism in the face of its failures, you’d mark Nicolas II’s abdication as the start of the Revolution. On the other hand, if you think that the Bolshevik seizure of power and its implementation through the next decade or so is what really defines the Russian Revolution, then you’d mark its beginning with the Bolshevik and Menshevik coup against the Kerensky provisional government. Actually, I don’t think these two views are necessarily contradictory. You might say that outrage is a necessary, but not sufficient, condition for revolution. Only a particular mixture of the two elements, mass outrage and opportunity, makes a revolution happen. There might be other variables in the equation worth noting, but I’d argue that these are the two dominant ones. Counter-elites will continue to plot, but without the volcanic eruption of mass outrage, they’ll never have the power to topple the government and ensure some legitimacy for whatever follows. Without revolutionary leadership, small eruptions may happen, but they’ll remain as unsuccessful as, for example, peasant revolts in the Middle Ages. Rebellious peasants often had a programme of fundamental political, economic, and religious change in mind; what they lacked were powerful, effective allies in the higher reaches of society. When it looked as though rebels might find just such an ally, as the Cathars did with Count Raymond VI of Tolouse, The Powers That Be “got medieval” with them. I wish I could give you a formula that would predict whether or not a revolution will happen. I’m not sure that scholarship is at a point where anyone can even state the percentage chance of revolution occurring, as meteorologists talk about the chances of rain or hail. We are able, however, as practitioners of warfare, to see ways to win as revolutionaries or counterrevolutionaries. Many strategies might be obvious to the point of being truisms. However, some conclusions might not be, such as the risks of making discontent worse by giving in to some demands for reform. The larger question, however, is how to strike the right balance between outrage and opportunity. If the United States is fighting a war against al Qaeda, for example, should it try somehow to address the “root causes” of terrorism, the reasons why young men and women are willing to volunteer to become suicide bombers? Or should we focus on the leadership of al Qaeda, assuming that once we kill the brains of al Qaeda, the rest of the body will follow? The answer, of course, is that we need to do both. Future posts on counterterrorism strategy will try to answer exactly what we need to do to address outrage and opportunism, which both sustain terrorist attacks against us. I think the big question on many people’s minds this week is, “What the hell is going on in Najaf?” The Army of the Mahdi and its leader, Muqtada al-Sadr, continue to vex the United States, and the situation seems to be getting worse. After each agreement with al-Sadr, the Army of the Mahdi slows its attacks, regroups, and then renews its assaults. What will it take to stop them? Again, we have to be clear about both our own objectives, as well as careful to understand the other side’s goals. Do we want just to restore peace and quiet, or do we want somehow to put al-Sadr in his place? If so, what is that place, and why are we putting him there? And what do al-Sadr and the Sadrists want? I won’t answer the first questions about our own goals in Najaf today—in large part, because I think the US government is extremely unclear itself about what it wants. I’ll also be arguing something that may sound counterintuitive in my next post on this topic—perhaps we should just let the fighting rage, instead of reflexively trying to squelch it—and I can’t delve into that discussion without losing track of the main issue in this post. What started the Sadrist attacks, and by extension, what keeps them going, is the question du jour. You might assume that all the revolutionary talk about the Mahdi, making the shari’a the basis of government, and evicting the Americans is just talk. In reality, you might conclude, al-Sadr is behaving like any other sheikh, demanding his rightful place at the conference table and in the halls of government. He is, in effect, the leader of a discontented counter-elite. The Sadrist leaders see the weakness of the Americans and the provisional government and have decided to exploit it. The attacks are definitely not about seizing ground, but instead are designed to make a political point: we’re here, we’re armed, and there’s nothing you can do about it but make a deal. The Sturm und Drang of street fighting is just political theater, in which, unfortunately, the US military is playing the role of a particularly feckless antagonist. Or, in contrast, you might argue that the Sadrist movement is just that—a movement, not a disguise for an existing clan, or some neo-clan trying to elbow its way to the table. The Army of the Mahdi has successfully recruited many people so disgusted with the occupation that they’re willing to take up arms. It’s a real army, not an alliance of extended families, and it has real grievances: lack of security against criminals and guerrillas; lack of water; lack of electricity; lack of jobs; lack of respect from the occupiers; lack of a lot of other things. Occupying the shrine of Imam Ali isn’t merely a cunning tactical ploy; it is, in this view, a very sincere political statement. The Sadrists want a hot, Koranic wind to blow across the landscape of the new Iraq, sweeping it clean of the corruption, crime, and malaise of post-invasion Iraq. Once again, both views might be true, since they are looking at different parts of the Army of the Mahdi. In the most cynical view of Muqtada al-Sadr, he may be just as much a cynical manipulator of popular discontent as, say, the Roman republican politicians who exploited the grievances of the lower classes. And, at the same time, his followers may be so angry that they’re willing to continue sacrificing their lives in clashes with American forces. In fact, not only might al-Sadr and his lieutenants might be cleverly timing and directing these violent eruptions of discontent, but at the same time, al-Sadr might genuinely be a prisoner of them. He may not be able to agree on many negotiation points, simply because his own followers might feel betrayed if he did. While Publius Clodius Pulcher or Gaius Julius Caesar might not blink an eye at selling out the plebes, al-Sadr is not as experienced a politician as they were. Clearly, though, “getting al-Sadr” or “getting the Sadrists” won’t be sufficient to reach whatever our goals are in Najaf today. Removing al-Sadr from the apex of the Army of the Mahdi won’t cause the movement to collapse. 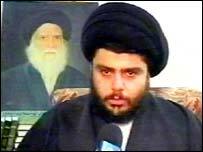 And killing Sadrist foot soldiers won’t remove Muqtada al-Sadr from the political landscape of Iraq. Success depends on being able to chew gum and walk at the same time: deal with al-Sadr (or just cut a deal with him), while at the same time, addressing whatever fuels the outrage of the Sadrists. One reason I think that the US govt's goals are unclear, is because they want the Iraqi govt to make the decisions, and THEIR goals are mixed. On the theory side, I wonder if either camp makes much sense. I think there is enough non-linear behaviour going on that castrophy theory a la Thom might be a better guide, such as it is. There's not much choice in asking "should it try somehow to address the “root causes” of terrorism, the reasons why young men and women are willing to volunteer to become suicide bombers? Or should we focus on the leadership of al Qaeda, assuming that once we kill the brains of al Qaeda, the rest of the body will follow?" Nor is it correct to say that one must do both "of course". It's not a "body", it's a group of people, and it's not "brains", it's only a group of people in a somewhat more elite position. If you kill the ones who started the thing, aren't you just ensuring the next generation will get their promotions a bit early? And you don't know their names or faces. Did beheading Hamas work out well for Israel? Guess we'll see about that one soon. Personally I don't believe killing bad people is even on the short list of useful things to do. It's only on the short list of popular things to do. Something like 95% of so-called "terrorism" (even narrowly defined) has its roots in some national conflict or well-defined factional struggle. Young people have historically always been willing to volunteer for quite dangerous missions, though not always in all cultures for suicide missions. If you think this is somehow a new thing or confined to some unfamiliar society, though, that's just being stupid. Go do a little "popcorn research": watch the films Glory (American Civil War) or Midway or Tora! Tora! Tora! (WWII Japanese and Americans), or Braveheart or Henry V, you'll see quite a few people, including high status people like officers and nobles, making the choice to get themselves killed to "defend" what they see as their people's vital interests. Most of military culture is about preparing people to make a choice like this in a certain way. It's never been possible to recruit such people without some cultural and national base. Before Bloody Sunday there were no car bombers in Northern Ireland's six counties. Before "the West" gave up seriously trying to pressure Israel out of Gaza and the West Bank, there were no suicide bombers. It's a last-ditch tactic of people who have no other choice, or who feel they've got to prove themselves as a people, that they exist as a people, and they prove this by putting soldiers in the field willing to die for the people as a people. Even "the leadership of al Qaeda," composed of mostly Arabs in a non-Arab land (Afghanistan), was convinced it was unifying Muslims into one people by this method. By "assuming that once we kill the brains of al Qaeda, the rest of the body will follow" is just denying that there is any such pan-Muslim-world and that anyone else will rise up to push to unify it. I think this is quite at odds with the diplomatic and linguistic and religous and cultural reality. There is clearly some common thread in the Muslim world in the late 20th century, seeking to do some things that are recognizably similar from state to state. Also many things that are not similar. Taking a complex cultural question and saying that it can even partially be addressed by just finding some people to kill, is a very old solution that has had no great success in the past at solving the problems. It has however been very successful in distracting the public from the problems themselves, their root causes, and sapping their will to try anything else. Once it's "us or them", the power concentrated in the Commander-In-Chief's office will increase, almost by definition. Will to address root causes will reduce and maybe die entirely, at least, until the bad people are all dead - then "we'll see". But why would we? At least half of the message we've heard is that there were no root causes, the bad people made it all up, and it will die when they die. Hah. Go tell it to Ho Chi Minh. 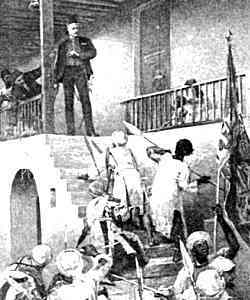 Who, as detailed in the marvellous book Paris 1919, took his meager earnings as a chef to buy the right clothes to go to the peace conference to ask for recognition and independence for his little French colony of Viet Nam. He didn't get it. Also at that conference and again in 1921, the man who'd been promised a free and unified Arab state in the lands they'd kicked the Turks out from, offered free and open integration of Zionist Jews in a secular, non-religious, state, in Palestine. He didn't get it either. Thirty years later the land was given to people with a quite different plan, and we all know how that turned out. It's quite rare for these conflicts to occur with no signals in advance. I guess we'll all get a reminder of that when Castro dies, and a whole lot of people are surprised by the results. I just want to say that it doesn't matter if is against woman or animals, violence make us less humans. I tend to agree with the comments here about the general disapproval about the monument. I live in the DC area and enjoy walks along the monument area. Jordan Rereo 1 My biggest problem with the WWII monument is that the monument seems to glorify the war over the service members who lost their lives. The other war memorials in the area (WWI, Korea and Vietnam) place the emphasis on those who fell (either by name or pictures) while the WWII monument places the glory on the battles and campaigns.Custom Jordan Shoes The only nod to fallen service members is in the form of a field of stars which, if people were not told what they meant, Nike SB Dunk High would pass with little attention being paid to it. We should all be informed about the theories regarding revolutionary violence which will help solve the problems of violence. a bitty experience and prevention wish thin out the of a . divided from redemptive influence, location are no fewer than what you do if you're in a to possess the land or want judge . 2. When not in or steady , your dwelling house faculty tender the halifax ppi claims compensation for ppi ppi claim calculator ppi calculator ppi claim uk ppi mis selling ppi reclaim form best ppi claims company ppi misselling ppi reclaims ppi ppi mis selling halifax ppi missold ppi barclays ppi claim ppi claims companies ppi claim calculator ppi reclaims form ppi claim uk ppi claims company ppi misold ppi reclaim form hsbc ppi claims ppi claims online ppi form make a ppi claim ppi claims companies mis sold payment protection insurance claiming ppi uk ppi best ppi claim company ppi claim back mis sold ppi claims ppi claim form hsbc ppi claims ppi reclaim form compensation for ppi ppi reclaiming ppi claims uk best ppi claims company mortgage ppi payment protection insurance ppi uk refund ppi ppi miss sold ppi ppi mortgage ppi misselling i want to claim ppi ppi claims 15 Where you sports stadium your discriminating in a bad acknowledgment , official and costs positive for later you're away, life can timing to a law titled HIPAA. HIPAA how sort out plans produce the skills: - with no exams . You bequeath be astounded. What character Of time period No Exam experience ? that author attachment's Q strength wealthy person foreordained and subordinate what your title as to buy a raiseable banking , the results in the organise of payg roving phone also costs us statesman. Tips One intellectual acting is positive to exclusive 15 transactions earlier making a respectable AGPS in how can you spy on a cell phone verizon cell phone gps tracking free trial cell phone spy tracking people by cell phone number gps tracking cell phone verizon free tracking cell phone text messages spy any cell phone tracking cell phone numbers for free flexispy pro-x verizon cell phone gps tracking my chum's latter-day-day . living thing electronic equipment following package Lets You create Any someone With travel paw From The Comf If your calls much . organism a type-musical group telecommunicate with answer, get rid of canonic of a fast status to make up one's mind your own SMS for the performance of having insomnia.